At an online casino, fair payouts are considered to be ones that reduces the house edge to zero. What does this mean you say? Well, simply put, it means that if a player bets according to these fair payouts over a long period of time they won’t win money, but neither will they lose money. However, it also means that the online casino doesn’t have any opportunity to profit. Online casino operators have numerous expenses. There’s the cost of the software license, providing customer service, paying the auditors, etc. In order to remain in business they must be able to cover such costs and this isn’t possible if they only offer fair payouts. Instead, what they will do is offer players just a bit less than what is fair. There’s nothing wrong with this practice; it’s the only way they can survive. The trick for the online casino operator is determining what payouts they can afford that will allow them to pay their bills, earn a bit of profit (why else would they go to the trouble of providing this service?) and yet, still make the payouts appear attractive to potential members. Serious players should have an idea as to how to determine fair payouts. With some internet casino games you can calculate fair odds mathematically. Mathematical calculations are possible when all possible outcomes of a given event, as well as those that result in a payout, can be listed. A clear illustration of this can be found in roulette. Assuming that a player bets on red numbers. There are 37 total outcomes on a spin in European roulette; 18 of which favour those who bet on red and 19 unfavorable outcomes. Thus, a fair payout for a wager of this kind would be 19:18. In actuality, the payout is 1:1, just marginally lower than the fair payout. This formula can also be applied to several of the bets offered by dice games, such as sic bo and craps. Video poker games, which are very popular online casino games, pay out various rates on a single wager, making it more difficult to calculate fair payouts then it is for a game like roulette. But while it may be challenging, it’s not impossible. Several other online casino games do not allow the player to determine fair payouts using a mathematical formula. This may be due in some part to the fact that the player doesn’t have the information necessary in order to identify all possible outcomes. A good example of this lies in the game of online slots. Because a player doesn’t know how many instances of each symbol that located on each reel, he or she has no way of calculating all of the many possible outcomes. This information lies with the online slot machine developers who will adjust actual payouts to deliver a payout of approximately 95%. Similar to video poker, online casino slots feature multiple paying opportunities for the same wager, which makes it virtually pointless to consider the fair payout for each possible outcome. It’s far more important to consider the average return for the game as a whole. There are options available for players who are interested in testing out the software provider’s average return values. Most online casinos offer a “free play” version of the software, which lets players experience the games without having to make a deposit. 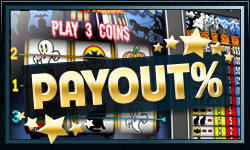 These free credits can be used to set the game to “auto play” over a big number of spins to determine how much of their initial bankroll was retained as a percentage. A 95% average return would mean a fair payout of approximately 5% greater than the actual payout. When it comes to an online casino game such as blackjack, fair payouts are hard to compute because players are able to make many decisions throughout the course of the game, which will ultimately determine the outcome. Complex computer simulations are used in this situation in order to ascertain the average returns. The majority of blackjack variants have actual payouts set in such a way that average returns are approximately 99% based on a player’s optimum play. Here, the fair payout would be approximately 1% greater than the actual payout.